Stretch marks (medically known as striae distensae) appear as parallel lines that have a different color and texture than the surrounding skin. They range from reddish purple or pink to light gray or white and may be indented. These lines often appear after rapid growth or changes in weight, such as after an adolescent growth spurt, weight gain, pregnancy, or sudden increases in muscle size. They may also be seen in certain medical conditions or as a side effect of long-term steroid use. Biologically, stretch marks are similar to scars with altered collagen and elastin. Most commonly, they appear on the outer arms, breasts, thighs, buttocks, and abdomen. Risk factors for stretch marks are younger age, family history, increased body mass index, and excess rapid weight gain. Few studies have confirmed effective methods for prevention. However, daily massage with Centella asiatica extract and hyaluronic acid has shown some promise. While moisturizing can’t hurt, the only real prevention is to avoid rapid gains in weight and muscle mass. If using topical steroids, it is advised to limit the duration of use on sensitive areas, use the lowest potency possible, and alternate with non-steroidal alternatives. For pregnant women, the best way to avoid stretch mark formation is to maintain the recommended weight increases and stay hydrated. While some stretch marks will fade over time, early intervention offers the best chance of improvement. Topically, prescription tretinoin 0.05% or higher has demonstrated up to 47% improvement. Procedures including lasers, excimer phototherapy, and microneedling with PRP have also been utilized with success. For red, purple, or pink stretch marks, lasers that target vascular lesions work best. This includes pulsed dye, KTP lasers, and laser genesis. Stretch marks that are hypopigmented, or lighter than normal skin, have shown response to Excimer 308-nm targeted phototherapy treatments in up to 80% of patients. Non-ablative lasers, such as the Cynosure 1540 XD and XF, have demonstrated the most consistent results with 50-75% improvement in treated lesions. 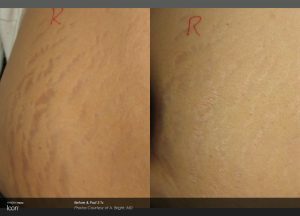 Microneedling with PRP offers a unique mechanism to treat stretch marks through formation of micro-traumas while driving in platelets to augment the healing response and stimulate formation of new collagen and elastin. Stretch marks are highly troublesome but notoriously difficult to treat. While prevention is best, genetic and environmental factors often do not cooperate. Once formed, improvement may be achieved with early treatment using a combination of modalities. Multiple sessions are generally required for best results.